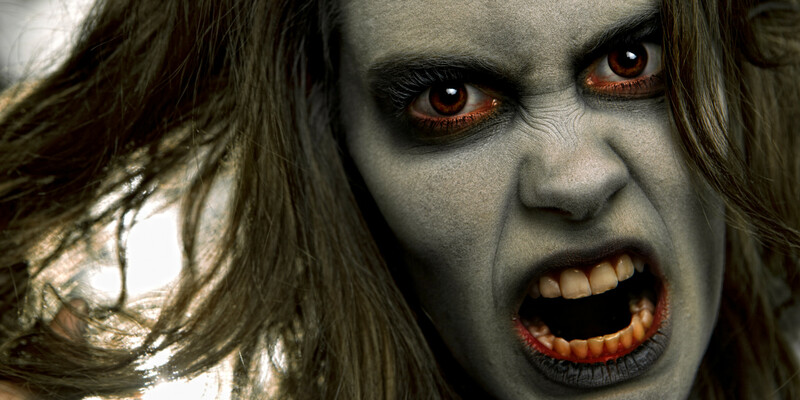 Your Best Zombie Face Will Work Wonders In The Board Room. They may not be a pretty bunch, but there is much to be learned from a world over taken by zombies. There is an old saying, “It trickles down from the top.” If you are asleep at the wheel, your employees will be too. To keep your company alive, you need to metaphorically remain awake 24/7, which means more silly isms, such as “The early bird catches worm.” High-functioning successful business owners and CEOs are the first into the daily fray and the last to leave the battlefield, so plan your life around this ideology and your employees will follow suit and productivity will remain high. The walking dead have a one-track mind: fresh blood. That is all they think about. The apocalypse has paid off with this myopic focus. And remember, there are far more of them than there are survivors, so there is something to it; the zombies are clearly doing something right. As Tim Ferriss notes in his book The 4-Hour Workweek, extreme focus will help you achieve your highest goals. Cut the fat out of your life: Spend less time on people who waste your time, less time scrolling aimlessly through Facebook, with idle chat, shopping online and on negative thoughts and people. Time is your most finite resource. This is your time, don’t waste it. Sometimes you don’t really have news or a new idea, but if you make enough noise, the dead will come running. If you sit still, nothing will happen and the zombies with simply stumble by you. If, however, you want to get more business, make some noise. Remember the saying “If you want the same outcome, do the same thing”? Well, if you want a different outcome, you need to do something different. Without action, everything stays stagnant. Take extreme action to achieve extreme results. If you need to be like the dead to survive, just smother your body in a dead man’s guts. Likewise, if you are not the head of the company act like you are, and more importantly look like you are. In 2011, real estate mogul and business impresario, Barbara Corcoran, spoke at the Inc. magazine women’s conference on the value of always making her business appear bigger and more successful than it actually was. She said, “I always made my business look bigger than it was.” Why? Because there is another old maxim that holds true, “Birds of a feather flock together.” If you want to soar with the eagles, you had better have the right plumage. Like running with the dead, getting ahead in business is not complicated; just pick up the speed. What do your competitors really have over you? Not nearly as much as you might think, most of them are actually quite…dead. Just look around. Many larger companies have more resources, but they also have many more zombies in their ranks slowing them down. If you put the time in, add some focus, make some noise and run a little faster, you’ll get ahead, fast. If you want to succeed in business you cannot let them keep you down. Business is tough, and they’ll be lining up to knock you down. Whatever happens, bloodied or bruised, just get back up. Paula Conway is an American entrepreneur, media expert and best-selling author of five books, the first an Amazon best-seller with Harper Collins. Conway founded Astonish Media Group in 2000 and has been working with high profile clients, Fortune 500 companies and early stage startups in every aspect of media and communications outreach for more than 20 years. Her new company, Astonish Life by Paula Conway, a business and success coaching platform, launches in 2018. She holds an MFA from Columbia University and a BA from New York University. The ONE skill that separates FUTURE leaders from others!